Publius Cornelius Scipio Africanus was a Roman general and later consul who is often regarded as one of the greatest generals and military strategists of all time. His main achievements were during the Second Punic War where he is best kn own for defeating Hannibal at the final battle at Zama in 202 BC, one of the feats that earned him the agnomen Africanus. Although considered a hero by the general Roman populace, primarily for his contributions in the struggle against the Carthainians, Scipio was reviled by other patricians of his day. In his later years, he was tried for bribery and treason, unfounded charges that were only meant to discredit him before the public. Disillusioned by the ingratitude of his peers, Scipio left Rome and withdrew from public life. 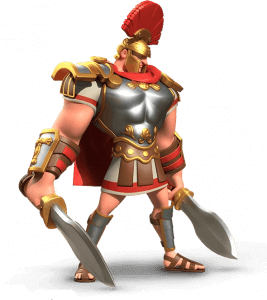 Utter Annihilation Passive	 When attacked, Scipio has a 15% chance to increase his troops’ attack by 100% for the next 2 seconds. Effect can only trigger once every 5 seconds. Scipio has a 15% chance to heal a portion of his slightly wounded units (Healing Factor 500) when his army has less than 40% of its units remaining.